Registration Fee: Includes a t-shirt and post-race refreshments. Course: Race starts at the intersection of Hersh Avenue and Pennsylvania Avenue, moves down Pennsylvania Avenue to Main Street, east on Main Street to Longwell Avenue, ending at Paide Way/The Armory. 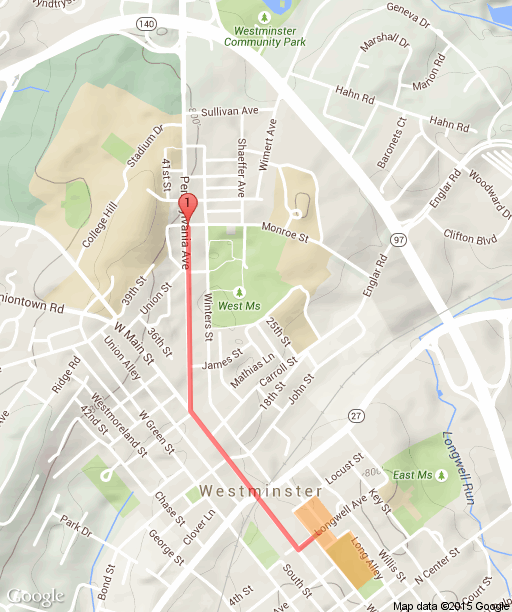 Race Packet Pickup: Westminster Family Fitness Center, 11 Longwell Avenue, Westminster, MD. Tuesday, September 24th 8 a.m. – 8 p.m.
Wednesday, September 25th 8 a.m. – 8 p.m.
Thursday, September 26th 8 a.m. – 12 p.m. Registration closes at 12 p.m. on Thursday, September 26th. No registrations after 12 p.m.
Prizes: Prizes will be awarded for Top Male and Female in both Youth and Adult categories. Registration Information: All entry fees are non-refundable and non-transferable. Rain or shine. Strollers and leashed pets welcome.